After a career as a guitarist for Dutch bands Bodine and Vengeance and then a failed attempt at a solo album, Arjen Anthony Lucassen started his Ayreon project, chiefly inspired by the rock operas of the late 1960s and 1970s. This project would eventually blossom into a series of rock opera styled concept albums, but it had its humble beginning with The Final Experiment, released in 1995. The Final Experiment contains both science fiction and medieval themes. It basically tells the story of a blind minstrel named Ayreon who lives in 6th century Britain. After experiencing an apocalypse in the year 2084, scientists make use of something called Time Telepathy and transmit messages back in time to warn people in the past of an impending doom. Because Ayreon is blind, his other perceptions are more acute which allows him to receive these messages as visions. The concept is interesting and one might conclude it to be overly complex for a musical storyline, but somehow Lucassen pulls it off and keeps it short enough to fit on one disc. By doing this, he keeps this rock opera from doing what so many others have done and that is overdoing it and resulting in much filler. Although I find the story to be interesting and charming, what disappoints me is the music. It seems mediocre for the most part and lacks the development of musical themes that are so prevalent on future Ayreon releases. I sense an equal blend of symphonic progressive rock and prog metal, with many folk elements. Like most rock operas, this one has its share of guests. These include Barry Hay (Golden Earring), Edward Reekers (Kayak), Ian Parry (Elegy), Jan-Chris de Koeijer (Gorefest), Lenny Wolf (Kingdom Come), Cleem Determeijer and Peter Vink (both from Finch), and other lesser known artists. 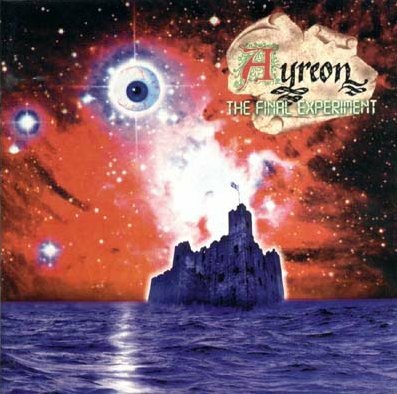 With a host of guests, both vocalists and musicians, an interesting science fiction concept, and a mix of symphonic prog and prog metal, Lucassen established the winning formula on The Final Experiment that he would repeatedly use in future Ayreon releases. A nice debut, but musically not as good as future Ayreon releases. If you really like later Ayreon releases, you might find this one pales in comparison. Definitely a must-have for die-hard fans. Good, but not essential. Three stars.